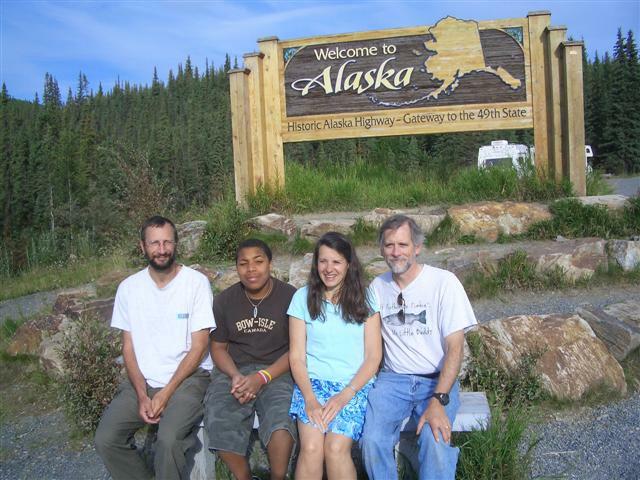 Our big adventure in summer 2007 was a six week road trip to Alaska. We left Eugene in our motorhome mid July, picked up Curtis at the end of his camp on Bowen Island near Vancouver, BC, and headed north. On the Yellowhead highway outside of Prince George, we met up with our good friend and fishing buddy, Steve. Steve is recently retired and on the road full time in his new little RV, and for the next six weeks we traveled as a mini caravan. We headed west to Prince Rupert to travel the ferries of the Alaska Marine Highway system throughout southeast Alaska, visiting Ketchikan, Prince of Wales Island, Wrangell, Juneau, Skagway, and Haines. From Haines we drove to the interior around the Wrangell Saint Elias range with a visit to the old copper mine in Kennicott, and on to Valdez. A ferry took us across Prince William Sound to Whittier and the Kenai Peninsula. We explored Seward and Homer on the Kenai, doing some salmon and halibut fishing, then on to Denali National Park via Anchorage. From there, we began the 3000 mile drive back to Eugene via the Alcan and Cassiar highways. Here are some pictures from the Southeast Alaska part of the trip, as well as the time on the Kenai. In addition to spectacular scenery, we saw many salmon runs and caught all five species of Pacific salmon and sent halibut filets back home to our freezer. In Wrangell we splurged on a side trip to Anan Creek, where the Forest Service has a platform for observing black bears and brown bears feasting on the salmon. Look here for our pictures of the bears. In Haines we splurged on a sight-seeing flight in a small plane over Glacier Bay. This view of the mountains, ice fields, and glaciers was breathtaking. The pictures of our flight can hardly capture the awe inspiring rawness of the wilderness. Here are pictures mostly from Denali and the Alcan on the drive home, but there are also pictures of the Kennicott mine side trip. Our old motorhome held up well throughout the journey, and family relations were still intact after six weeks in a confined space. It is a sign of a great trip that we really didn't want it to end.